Some birthday celebrations are extra special. When you want to gather your whole extended and/or blended family together and have room for all your closest friends, you need more space than your home can afford. Pongal Event Center is the ideal venue for your birthday celebrations. Decade birthdays—30, 40, 50, etc. Our venue is also perfect for other coming of age occasions, including Bar Mitzvahs, Bat Mitzvahs and graduation parties. If you would like to host a formal banquet-style party, we offer party supply rental to provide table linens and chair covers. Weekend events book fast, so call us to reserve your event today. If you would like party planning assistance, please contact Elaine, our experienced event planner, for more information about planning packages and services. 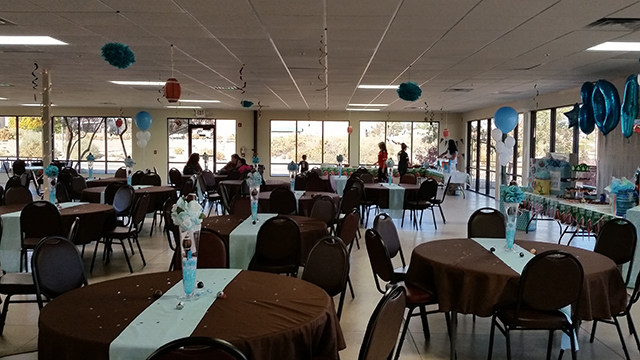 Celebrate your very special birthdays at Pongal Event Center in Rio Rancho, NM! Call us at 505.892.5022 to book your party today! Life is a fiesta. Come celebrate with us!